Why are Pop Up Display Stands so Popular? Pop up display stands are one of our best-selling, portable display products. They are a very popular marketing tool and widely used across the exhibition and display industry. They are used by everyone from small, start-up firms at their first event to larger, well-established businesses who regularly exhibit throughout the year. But what exactly is a Pop Up Stand and why are they so popular? A pop up stand consists of a scissored lattice aluminium frame which simply ‘pops up’ and fixes in place with magnets. Magnetic bars are attached to the frame in vertical rows. Printed graphic panels are then hooked over the top of the frame and attach magnetically to the bars. Each panel is the full height of the frame and panels fit flush widthways to create a seamless graphic backdrop. The number of graphic panels included will depend on the size of the stand you have chosen. For example, a 3x3 pop up display will have 5 graphic panels – 3 for the front and 2 ‘D’ ends (these curve around the end of the frame to give a neat finish). Most of our pop up stands come in a set. 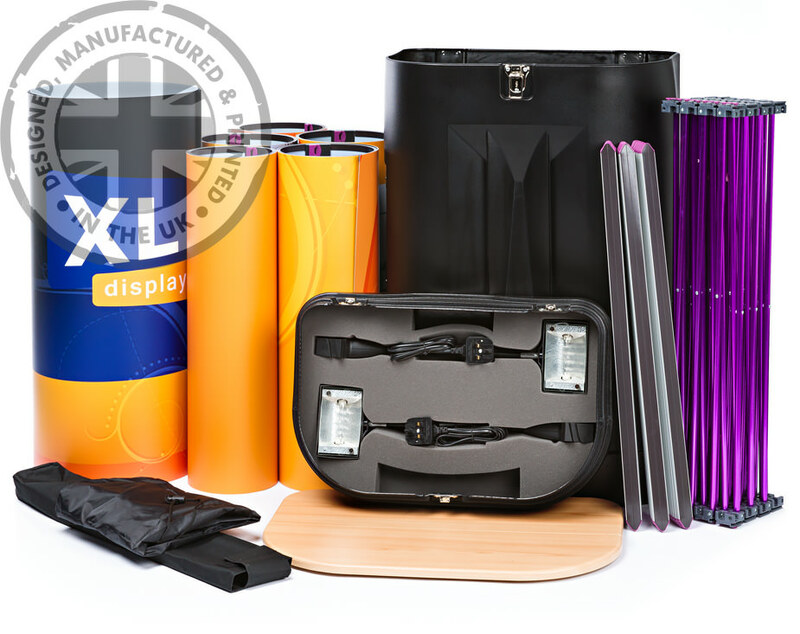 This includes: a hard case which fits all the equipment in, making it easy to transport and store; spotlights to illuminate your display; a beech counter top and printed graphic wrap which transform the case into podium for your exhibition stand. 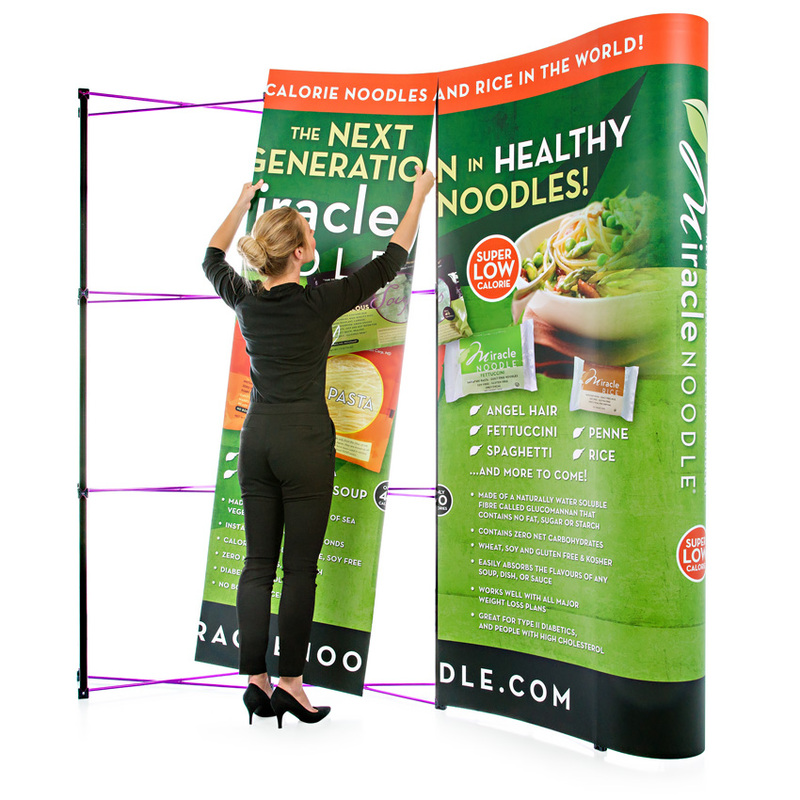 Pop up displays come in different sizes and you will see them referred to as 3x1, 3x2, 3x3 etc. The figures do not refer to metres as commonly thought; they refer to the number of squared sections in the frame. 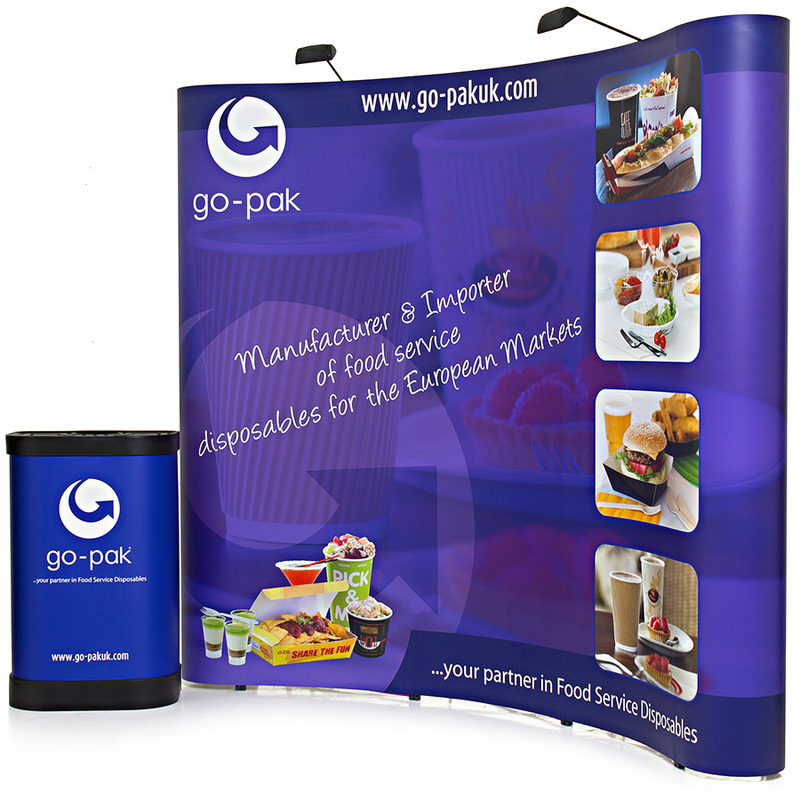 For example, a 3x3 Pop Up stand (as above) is 3 sections high and 3 sections wide. Our standard 3 section high pop ups are 2.2m high and widths vary depending on size. Actual dimensions for each size stand are listed on each product page. Why are Pop Ups so Popular? Easy and quick to assemble – one person can put up a pop up stand in minutes, no tools or specialist stand contractors are needed. We include set up instructions with all of our pop up stands. Portable – all of our pop ups come with a wheeled, hard case. Simply pack your pop up stand away into the case to store and transport. The case will fit into the boot of a car. Cost-effective – with prices starting as low as £377 you can get a whole display stand for little outlay but receive a high return on your investment. All you need – our pop up stands come with all you need for your event – a full display stand with spotlights and a case that can be converted into a promotional counter. 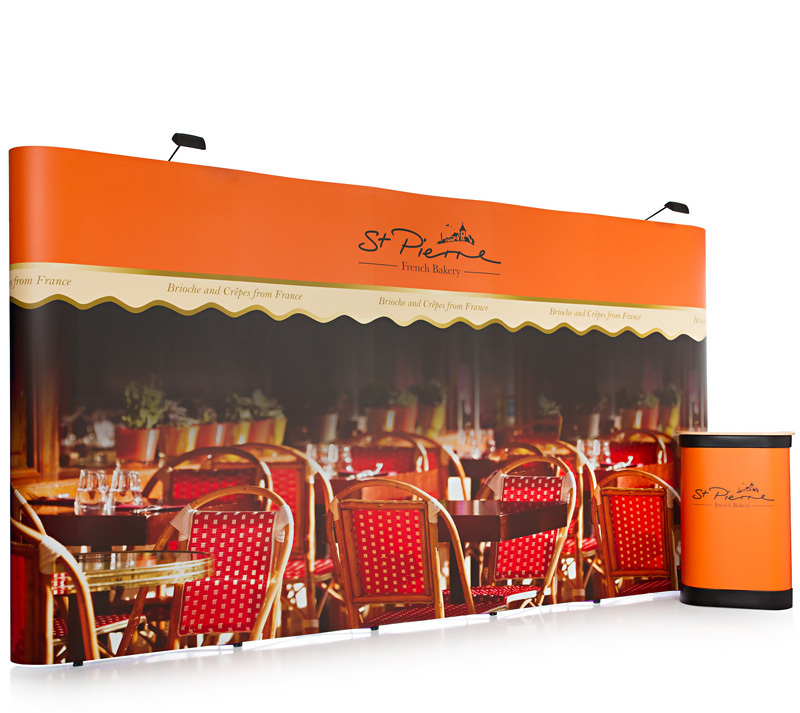 Seamless graphics – a pop up stand, whatever size, will create a seamless graphic back wall for your exhibition stand. This can fit within an existing shell scheme at an exhibition or can be used freestanding to create a display booth in shopping centres, reception areas, showrooms, supermarkets etc. Easy to update – when your marketing messages change you can update your stand by simply buying replacement graphics instead of paying out for a whole new stand. Range of styles – pop ups come in a wide range of sizes and styles. They can be straight or curved; single sided or double sided; and can be linked together to create larger display backdrops. Our standard size pop ups are 2.2m high but we also offer Midi pop ups (1.8m high) and Jumbo pop ups (3m high) so can find a pop up to fit the exhibitions space you have. 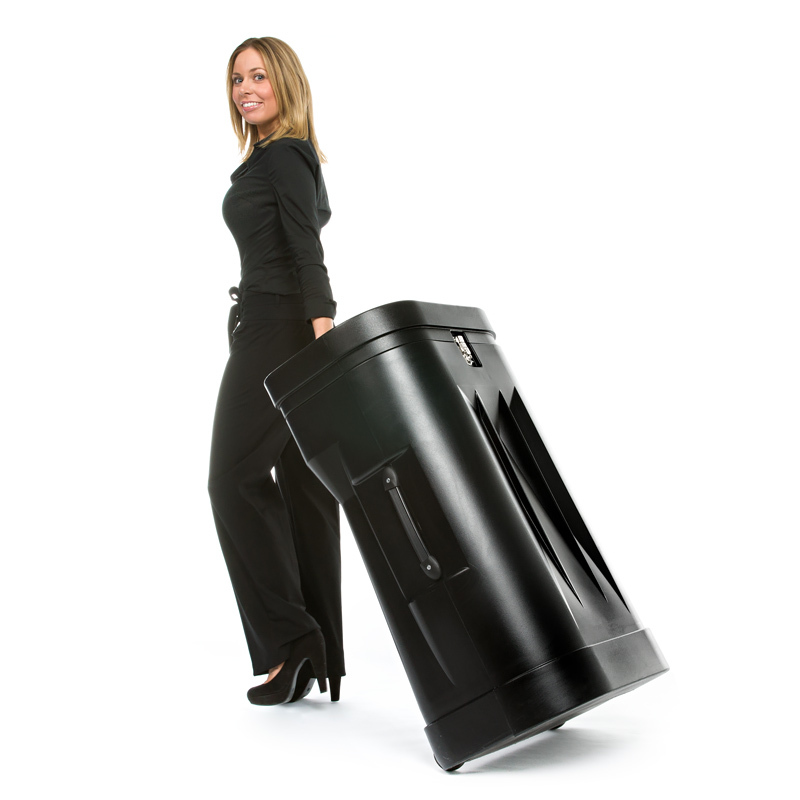 Use again and again – a pop up stand can be used over and over again so if you exhibit regularly a pop up is ideal. Even if your marketing messages change you can simply replace the graphics rather than the whole stand. A long lasting product, our pop up hardware comes with a 10 year guarantee. Why Choose XL Displays for your Pop Up Display Stand? Quality assurance – we print and manufacture all our pop up stands in-house so have complete control over the quality and finish of the product. We will only send out a pop up stand that has been test-built and quality assured. Price – we regularly review our pricing to ensure it is as competitive as it can be, without compromising on quality. We offer a price promise and will match a competitor’s price on a like-for-like product. Short lead times – we dispatch a pop up stand within 72 hours on a next day delivery courier service. However, we can offer an express service and dispatch within 48 hours – please call us on 01733 511030 for details. 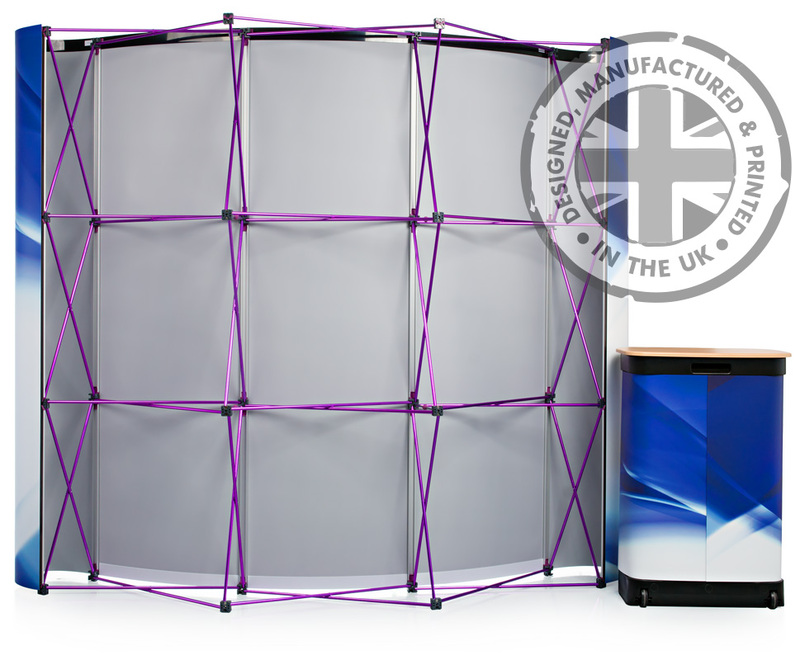 We know what we’re doing – we have many years of experience in designing, printing and manufacturing pop up stands. We use this knowledge and expertise to ensure you get a high quality product that is right for you. No artwork? Don’t worry – we offer a graphic design service and you can work with one of our designers to create a design for your pop up stand that is right for your business. High quality print and materials – your design will be digitally printed to photo quality standard onto 505 micron thick stoplight media. Each graphic panel is then laminated to give tear, scratch and crease resistance. Customer service – we are proud of our high quality customer service and we currently have a 9.3 rating on customer satisfaction on the independent review site Trustpilot. Be assured that we will help you through every step of your order to ensure you are happy. Our pop up display stands are easy to buy online and you can also upload you artwork via our website. Alternatively, call us on 01733 511030 for more information and to find the right display solution for your business.